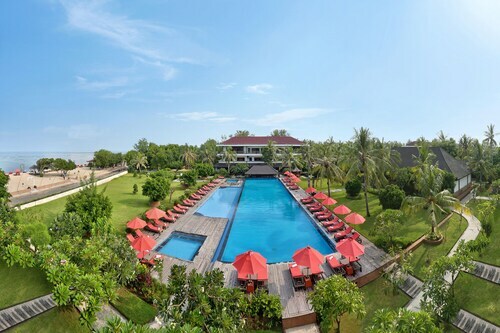 Situated by the sea, this hotel is within 1 mi (2 km) of Public harbour ticket office and Gili Trawangan Harbor. Gili Trawangan Turtle Hatchery and Gili Trawangan Hill are also within 15 minutes. 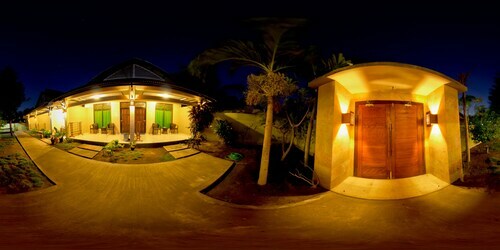 Situated by the sea, this guesthouse is within 1 mi (2 km) of Public harbour ticket office and Gili Trawangan Harbor. Gili Trawangan Hill and Gili Trawangan Turtle Hatchery are also within 15 minutes. 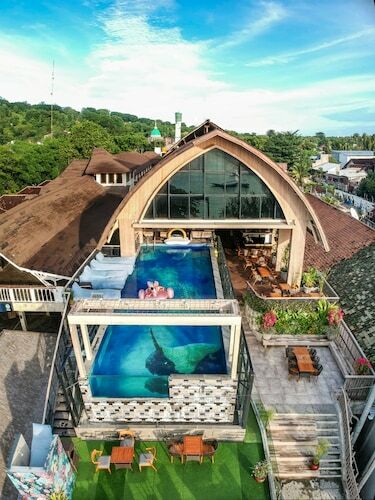 Offering direct access to the beach, this Gili Trawangan tentalow is 1.1 mi (1.8 km) from Gili Trawangan Turtle Hatchery and 1.5 mi (2.4 km) from Gili Trawangan Harbor. Public harbour ticket office and Gili Trawangan Hill are also within 2 mi (3 km). Wot about a trip to Gili T? 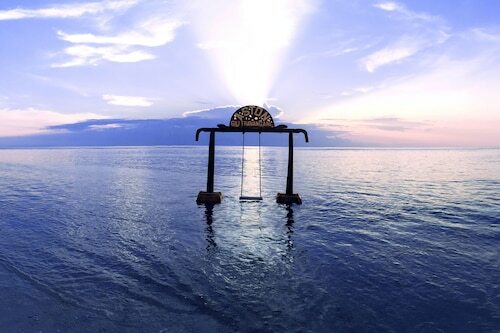 Gili Trawangan lies off the coast of Lombok and is one of Indonesia’s true gems. Often called just Gili T, it's the biggest and most popular of the three Gili Islands. 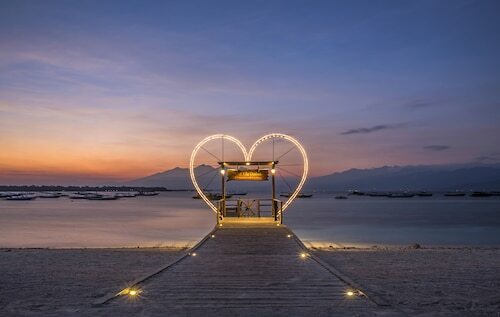 Known for its stunning beaches, clear waters, great water sports, vibrant night life and a relaxed vibe, book one of our a terrific Gili Trawangan Island hotels and discover this little slice of paradise. The island originally drew a large backpacker crowd, because of it's laid back vibe. However over time this beautiful region has been discovered and developed, becoming more popular with locals and international visitors. Why not spend a few days basking on heavenly beaches, swimming, snorkeling or just lazing around in in a hammock. To really soothe your soul, try one of the meditation or yoga workshops, or perhaps some luxuriate in a pampering massage on the beach. Surfing is also possible and you could hop on a boat to visit the other nearby islands. You can also enjoy some coastal walks. The coastline around the edges of the island are also quite pretty. As night time falls you have a choice between laid-back beach bars and all night music pumping hot spots or party cruises where you can party with the locals. There isn’t really much of a shopping scene on the island, although you will be able to find the essentials and souvenirs. There is a good selection of restaurants that cater to a variety of tastes. Book a cheap flight to Bali and then catch one of the regular ferries across to Gili Trawangan. 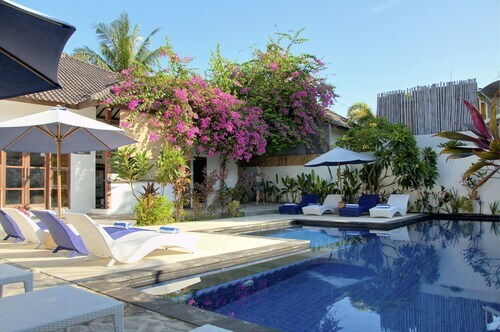 Even better, when you book your flight you'll score an accommodation voucher which will make our Gili Trawangan Island accommodation even cheaper! So wot are you waiting for? So stop day dreaming and book your dream holiday today with us. 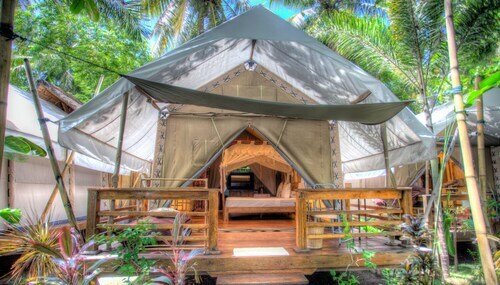 How Much is a Hotel Room in Gili Trawang? 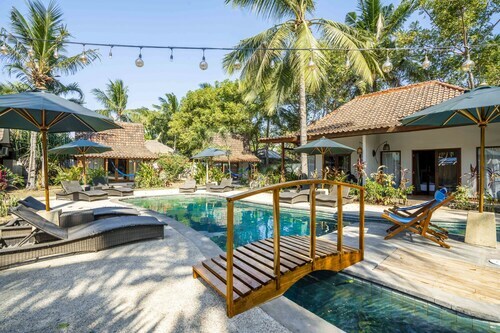 Hotels in Gili Trawang start at AU$53 per night. Prices and availability subject to change. Additional terms may apply.